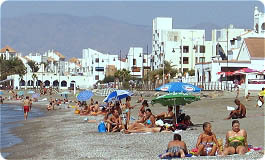 Almerimar is situated 40 km to the west of city Almeria in the province of Almería. It's a purpose-built resort constructed around the original harbour and flanked on both sides by Punta Entinas-Sabinar Nature Reserve and unspoilt beaches and it's only an hour from the snows of Sierra-Nevada. 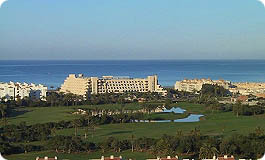 Almerimar is one of the province's most luxurious developments, a veritable oasis with all the services you need. More people each year are discovering the beaches, the sun and the natural beauty of this area. 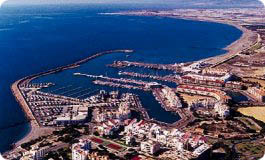 If you are looking for a relaxed way of life, free from stress, in a healthy environment, then Almerimar is for you. Water sports for the sports enthusiast are there excellent activities available. You can practice all kinds of aquatic sports such as windsurfing, swimming, fishing, diving, boating and yachting. 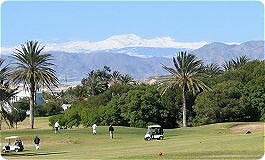 With the beach only metres away and its championship golf course, Almerimar is a delightful resort set amidst some of Spain's finest scenery highlighted by a backdrop of the Sierra Nevada snow capped mountains. 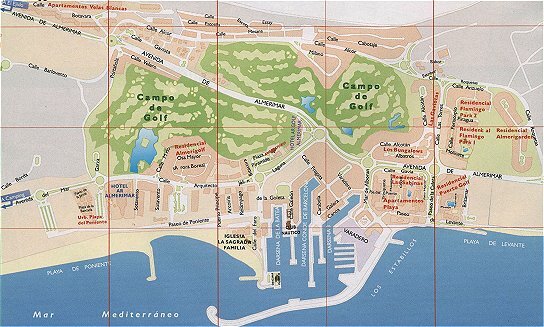 The 27-hole golf course is adjacent to the marina which overlooks the original harbour where traditional Spanish fishing boats work as they have done for centuries. The club has all necessary facilities, such as the hire of clubs, golf buggies and a shop and restaurant. The modern marina with capacity of 1.100 berths is full of various craft and is where one can enjoy a drink in a bar or a good meal in a restaurant, perhaps sampling the local fisherman's catch. At the harbour tower you can pick up fee local news papers every weekend in Spanish and in English. Plaza Varadero, close to basin 3, is one among other squares, were you can sit and relax over a cup of coffee or a bear and free tapas or get a meal during the day and evening. Normal opening from 9 am to midnight. Are you interested in nighlife, dance and disco are there a wide collection of bars and dancing places close to basin 1. Open normal from 10 pm to 3-4 am. At 3 am. open the pyramid were you can dance until 6-7 am. 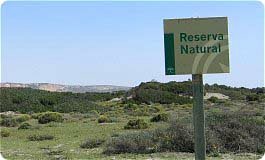 On the East side of Almerimar is Punta Entinas-Sabinar Nature Reserve. The reserve several 100 flamingos and shelters over 150 species of waterfowl and a prosperous community of vertebrates and can be toured on foot or by bicycle. Playa de Cerillos where nudism is allowed, and the lighthouse, a magnificent spot for enthusiasts of photography and submarine archaeology. 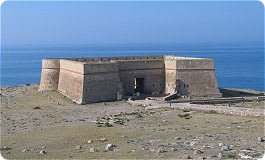 On the West side of Almerimar, only a few minutes away are Guardias Viejas (Castle of Old Guards). Built in the days of Carlos III (1764), under whose reign the coastal defences intensified. It has an entrance protected by pit and drawbridge, a parade ground that gives to access to the diverse dependencies and a semicircular platform watching the sea where the artillery was located. There is free admission to the Castle and the museum. In the summer months are there concerts every Friday. Look at the Culture Program for more information. As Almerimar is only two hours from the snows of Sierra Nevada it is possible to go skiing in the morning then return to soak up the sun on the beach in the afternoon. Almeria's climate is subtropical, warm and dry and holds the title of being the Andalucian city with the most hours of sun a year, a total of over 3,000. Simply, the climate is the best in Spain. If you enjoy golf, sailing, relaxing, beautiful Spanish scenery, the beach, sun and more, but want to avoid the usual tourist traps with their raucous clubs and bars, then this is the place for you.